Give your favorite gardener an untethered way to take his tools with him as he tends to his plants. This canvas tool belt has pockets of varying widths to hold everything he needs in one place. It even has customized slots to carry a few marking pens for times when he wants to label individual plants or larger garden areas. The sturdy material stays intact even if he carries his clippers sharp side down and the convenient buckle means he doesn’t have to deal with tedious ties to get ready. Gardening may seem like the tamest of hobbies, but it’s actually a dirty and dangerous affair. (Yes, dangerous!) Thorns act as daggers, sticks scrape you up and some sneaky weeds can cause rashes. Plus, while bacteria in the soil is great for plant growth, it’s not so good for open cuts. Help the gardener in your life avoid the potential pitfalls of his hobby with these bamboo working gloves. The breathable material keeps his hands cool on warm days but still protects him from dirt and abrasions. These snug gloves also have a non-slip coating on the palms to help him hold his tools and supplies better (it’s also smartphone friendly). Every gardener should have a compost bin as a convenient way to get rid of clippings and as an organic method for putting nutrients back into the garden’s soil. This compost tumbler allows anyone — even beginners — to easily start a compost pile. Compost materials need turning every so often (because oxygen helps decomposition), but gardeners typically have to get out a shovel and do it the old-fashioned way. With this gift, they just need to turn the tumbler five to six times every two to three days. Two different chambers allow one side to hold finished compost while the other stays open to fresh scraps. Take a look at other product reviews and shop for the best composters available online. Harvesting the fruits of your labor is one of the best parts of gardening. Often enough, gardeners end up with more produce than they can handle at once. To cut down on waste, gift your gardener friend this handy fermentation kit. The kit allows him to turn any leftover fruits and vegetables into kimchi, pickles, sauerkraut and other fermented produce variations. It includes three wide-mouth lids (jars not included), an oxygen extraction pump, a fermentation getting-started guide and access to a recipe e-cookbook. The lids have an airlock valve that keeps oxygen out but allows carbon to escape during the process, which prevents mold. And they include a date tracker that ensures a perfectly timed fermentation batch. Some gardeners want to keep it simple with a basic spade, hoe and rake, but others like to employ the big guns the gardening world. If you know someone who fits the latter description, gift him this electric leaf mulcher. It mulches up to 53 gallons of leaves every minute and deposits the debris into a bag waiting below. It quickly turns a yard’s worth of leaves into a pile of nutrient-rich mulch ready to fertilize a thriving plot. The mulcher weighs less than 20 pounds and quickly disassembles into four pieces that can be stored away compactly. Expandable garden hoses are an amazing, space-saving product for gardeners. This one is 17 feet when it’s dry, but it quickly lengthens to 50 feet once the water is turned on. It weighs much less than the typical garden hose — 3.72 pounds — and will never get kinks or twists in it. It’s the perfect option for watering plants outdoors, far from the house. Plus, this one comes with a free sprayer nozzle that has eight different streaming patterns to choose from. Need some more help finding what you're looking for? Read through our best garden hoses article. Heirloom vegetables have been handed down from generation to generation because they taste the best. Now you can pass them onto a fellow gardener with this heirloom seed kit. It has a total of 10 varieties of produce, including tomatoes, corn, peppers, cucumbers and more. Gardeners will get a kick out of tending to these plants because each seed type has a story behind it. For example, Delikatesse Cucumber seeds are originally from Germany and grow cucumbers perfect for pickling, while Calabrese Broccoli was first introduced to America around 1910 by Italian immigrants. These seeds supply your friend with great garden yields and a bonus history lesson. This clever contraption transforms from a portable garden bench into a cushioned kneeler just by flipping it over. The seat allows the gardener to rest as he waters larger plants or prunes bushes. The kneeler minimizes achy knees as he digs in the dirt and it keeps his skin away from the muddy ground. He can move the frame with him as he works — it’s less than seven pounds — and take his tools on the go in the two bags that attach to both sides. The frame folds up flat so he can easily store it away when he’s not using it. Interested in reading more reviews? Take a look at our selection of the best garden stools. If you know someone that wants to expand his garden plot, this brush grubber will help him clear the way. It uses strong spring-loaded jaws and 16 gripping teeth to securely grab onto brush and shallow-rooted trees. He can attach the brush grubber to a chain connected to a four-wheeler or tractor to pull bushes and trees out by the roots. 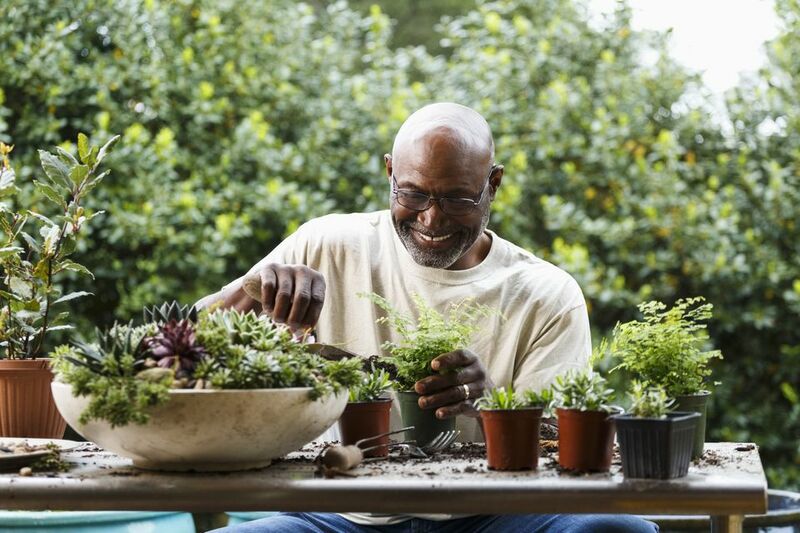 Plus, he doesn’t have to ask friends to come over with their shovels in hands because this tool lets him become a one-man gardening operation.